If you cannot go to the gym, take the gym with you! This seems to be the idea behind under-desk ellipticals and cycles. In today’s hectic life, finding a work-life balance is difficult. In office, you force yourself to sit behind your desk for hours that adversely affects your health. Medical experts contend that leading a sedentary life is more harmful than smoking. Moreover, in a study conducted by the University of Bristol, they found that people who exercise during work suffer less stress and are more productive. With an exerciser, you have a chance to redeem your health, while sitting behind your desk for long durations. What’s more, you do not have to break your bank or go in for the expensive standing desks. 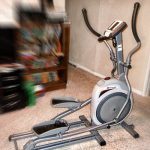 We found six of the best under desk elliptical exercisers to choose. Cubii follows the mantra of ‘Get fit, while you sit’. It is compact and ergonomically designed. Cubii offers eight levels of resistance, all designed to impart low to no impact to the joints. Its whisper quiet, smooth gliding motion lets you exercise noiselessly at your desk. The exerciser is Bluetooth enabled that syncs the Cubii iOS and Android app with Fitbit and Apple HealthKit. This helps track calories and strides, and set personalized goals. What’s more, you can share and compete with other users too. 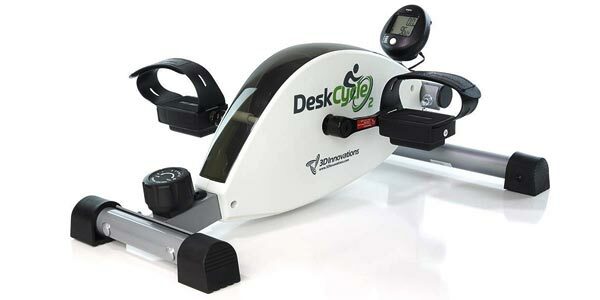 The DeskCycle is ideal for health and fitness. At 10 inches, it offers the lowest pedal height and is most suitable for desks as low as 27 inches. 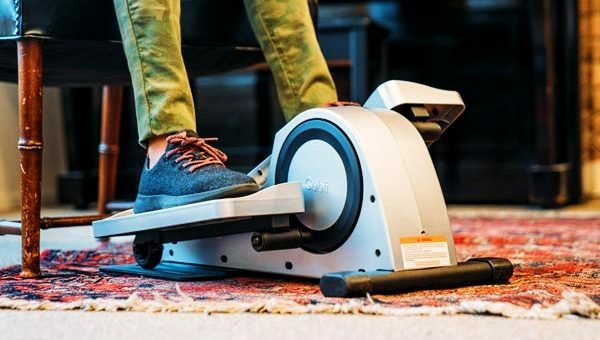 This exerciser offers eight calibrated magnetic resistance settings and a precision flywheel that provide smooth and quiet pedal motion that does not distract. At the lowest resistance setting, it offers one rotation per second. Ideally, a resistance level of three or less increases energy level and oxygen to your brain. Using this exerciser may seem you are not exercising at all. Actually, working on it increases your energy expenditure manifold that is more than using a standing desk. It also has five-function display that shows distance, speed, time and calories. Not only this, you can use the online calorie calculator on their website for knowing the exact calories burned. The multipurpose commercial grade MagneTrainer is not only excellent for a leg workout, but can also be used to strengthen your arms and shoulders, when used on the desktop. 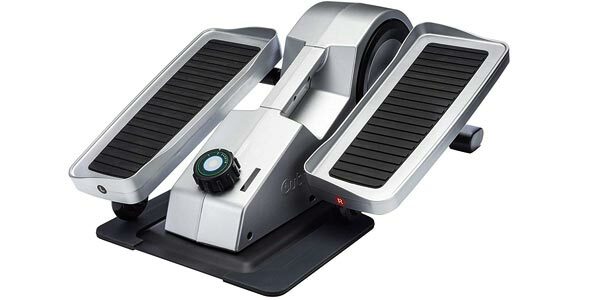 This is because, in addition to providing ultra-smooth pedal motion, it offers three times the resistance range of other magnetic pedal exercisers available in the market. Apart from exercising the body, this exerciser is also being used for physical therapy in hospitals, nursing homes and the like. The legs of the exerciser are over 15 inches wide and it requires a tall desk – between 34 inches and 36 inches. What make the MagneTrainer durable and so quiet are its wide 4V belts, heavier duty pulleys and flywheels, and its expensive German flywheel bearings. Its 15-inch steel base prevents it rocking from side to side, while pedaling. Its pedals come with adjustable Velcro straps and an electronic monitor that displays distance, speed, time and calories. 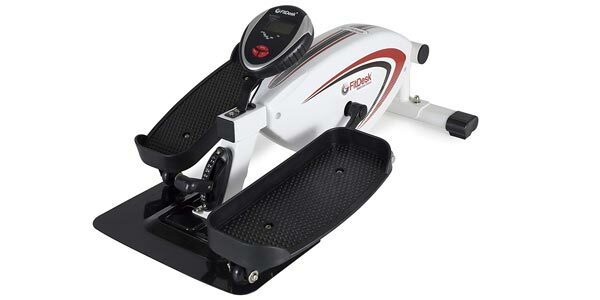 The FitDesk offers the lowest pedal rotation height of only eight inches. This makes it ideal for desks as low as 25 inches. Its smooth and noiseless pedal motion is due to an eight-position magnetic resistance and a balanced flywheel. What’s more, you can adjust its tension by means of a foot shifter, without using hands. Moreover, this power-packed bundle weighs only 30 lbs! 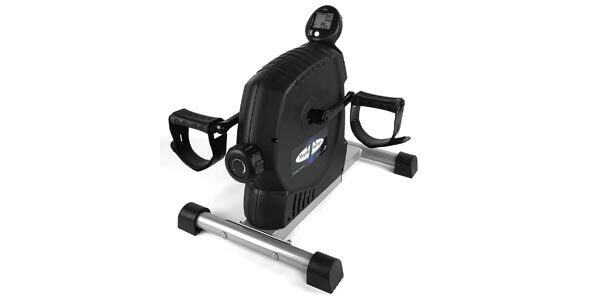 What is special about this exerciser is it uses a fluid to impart a natural forward and backward elliptical motion. This also creates a smooth motion for your legs and prevents them from hitting the underside of the desk. It offers a six-function display that allows you to track your progress on your desk. 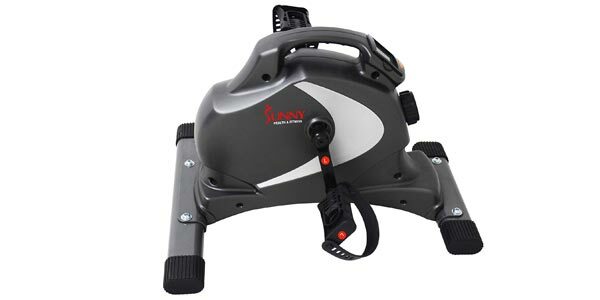 The Sunny Mini Exercise Bike is fitted with a handle for easy portability. 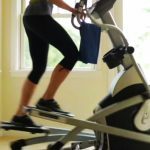 You can use this exerciser for both feet, hands, and it comes with safety pedal straps. A person weighing up to 220 lbs. (100 kilograms) can easily use this exerciser. The mini bike comes with a reliable and noiseless magnetic system that offers eight-level micro tension controller. Just by adjusting the tension knob, you can switch up the intensity of your workout. A simple twist increases or decreases the resistance to make exercising more challenging and effective. It is not only suitable for a moderate to intense workout, but is also perfect for any skill level. Installed with LCD displays, that gives out time, speed, distance, ODM and calories, it makes tracking your progress a cinch and helps keep you motivated. It also offers a convenient scan mode that continuously repeats these features to keep up with all calculations. The Drive Peddler offers multiple benefits for the whole body. Its advanced features not only increase mobility, but also the body’s circulation and at the same time strengthen your arms and legs. All these benefits combine to boost your overall health and fitness. What is unique about this exerciser is that it is foldable. With its folded dimensions in inches of 12.5 x 14.7 x 6.5, it is easy to carry and store. 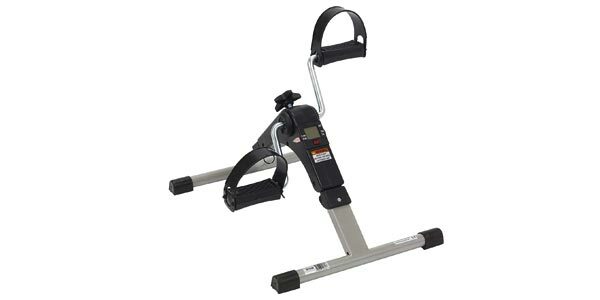 The exerciser comes with a sturdy and lightweight peddler with a display. Designed to monitor and record five different functions that are important for your overall health and well-being. By means of a scan feature, you can monitor the calories you are burning, the duration of your exercising and keep count of the RPMs. All you need to do is to press and hold the red ‘Mode’ button for four seconds when first operating. 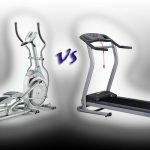 Whichever exerciser you choose, the result will always be the same, which is, getting you fitter and healthier, while you work at your desk uninterruptedly. However, choose equipment keeping in mind the height of your work desk and other parameters.